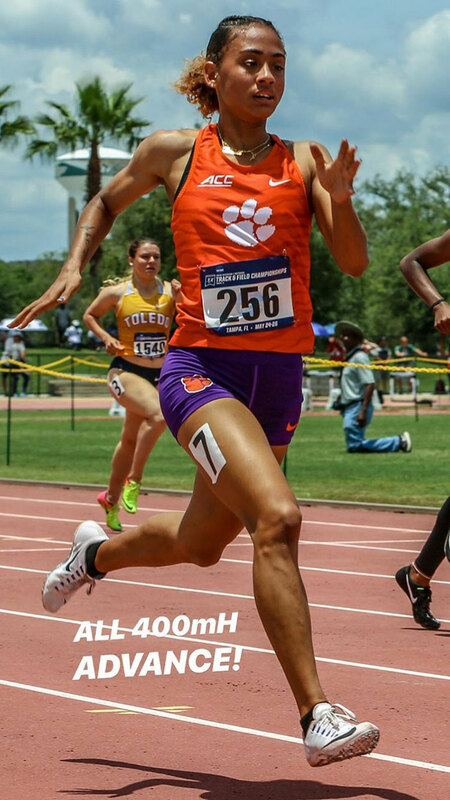 Clemson sophomore Lakeisha “Mimi” Warner, heading home in the 400m Hurdles, en route to qualifying for the NCAA Championships. PHOTO: Clemson Sports Information Dept. Clemson sophomore Lakeisha “Mimi” Warner, will compete in the 400m hurdles at the June 6-9, NCAA Division I Track and Field Championships in Eugene, Oregon, after advancing from the East Regional that wrapped up in Tampa, Florida on Saturday. Warner became the BVI’s eight athlete advancing to the NCAA Championships since 1979, after running 57.52 seconds to grab the last spot from the quarter finals. She ran 57.94, for an automatic place in the quarter final. Her goal at national is a simple one. Ashley Kelly and Chantel Malone were also part of their school’s relay teams as well. Meanwhile, eight BVI athletes competed at the 3rd Atlanta Georgia Relays in Douglasville, Georgia, and Adajeah Hodge accounted for five of the six medals, with three individual victories and two meet records in the 11-12 Girls Division. Hodge ran a 400m personal best and a meet record 57.80 seconds, to demolish the 1:01.17 mark established in 2017. Her 200m winning time of 26.46 seconds, shatter the 27.07 meet record established last year. She also won the Long Jump with a leap of 4.68 meters (15’4¼”). Hodge, on second leg, teamed with 13-14 Girls, Akeela McMaster, Amia Todman and Abriel Magloire, to grab 4×100 meters relay silver in 50.66 seconds, then she anchored them to victory on the 4 x 200m sprint relay, in 1 minute 48.48 seconds. In winning the 4 x 200m Relay which she anchored, they avenged a loss to Jamaica’s Wolmer’s School in the 4 x 100m. After placing fourth in the shot put with a distance of 7.93 meters (26’0”), Alexia Hodge who took up field events six months ago, secured a bronze medal in the 13-14 Girls discus throw, with a heave of 21.89m (70’11”). Asia McMaster was third in her 11-12 Girls 100m heat in 14.03 seconds, narrowly missing the final. Crystal Maximea placed fifth in the 13-14 Girls 100m dash in 12.92 seconds, after advancing with a time of 12.78, in winning her heat. Todman won her heat, but missed the final with the ninth fastest time of 12.98 seconds. Magloire was 12th overall after placing second in her heat in 13.26 seconds. Akeela McMaster was second in her 200m heat in 26.67 seconds, but missed the final by two places with the 10th best time. Magloire’s 27.52 seconds clocking had her ranked 21st. Latriel Williams was fourth in the 9-10 Boys 400 meters with a time of one minute 05.60 seconds, after winning his heat in 1:07.94 seconds—the fourth best time of the prelims. He narrowly missed the 200 meters final by .004, with his 29.20 seconds time.